Three of March’s finest running exports returned to their hometown at the weekend heading straight for Whitemoor, writes Barry Warne. Fortunately it was to race, and the homecoming trio took the podium places in the Whitemoor 5 miler. Using a similar course to the January Frostbite League race, mud was replaced by a sun-baked concrete-like surface. Daniel Watts took it all in his long stride winning in a time of 27.55 with his 32 year-old twin Glen finishing second in 29.07. The former Peterborough AC pair, now running for crack London outfit Shaftesbury Barnet AC, were followed home by former March AC and Nene Valley youngster Jevan Robertson. The Tyne Bridge Harrier, now based in Newcastle where he is completing a degree, clocked 30:00. There was further local success with Peterborough AC runner Maggie Skinner finishing as first lady in a time of 32:45 which saw her place 11th overall. PAC veteran Steve Hall also had a good run, finishing seventh in 31.38. PAC distance runner Steve Robinson ran the South of England 10k on Friday night in a time of 33.45. 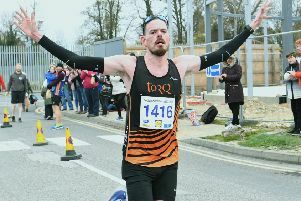 Former Nene Valley Harrier Jake Richardson took the local honours in the Lincoln 10k on Sunday. The race had fallen victim to ‘The Beast From The East’ in March, and there could not have been a bigger contrast as over 5,000 runners toed the line on a scorching sunny morning. Richardson finished seventh in 32.38 with his new club Lincoln Wellington AC claiming eight out of the top nine places. Athletes from PAC and Nene Valley showed well with PAC’s Ben Heron 14th in 34:50 ahead of Rob Brownlee of Nene Valley who finished 19th in 35:15. John Pike was 28th in 36:08 while his coach at PAC Paul Larkins finished 108th in 40:10. Nene Valley veteran Sean Beard was 68th in 38:34 and Mark Popple from Stamford Striders 47th in 37.26.